Federal Politics: Canadians a little less pessimistic about the direction of the country; Mulcair’s unfavourable numbers up slightly. According to a new survey by Ottawa-based polling and strategic research firm Abacus Data, Canadians are a little less pessimistic about the direction of the country, are a little more likely to approve of the federal government’s job performance, and are a little more likely to view NDP Leader Tom Mulcair unfavourably. Four in ten Canadians (40%) said that generally speaking Canada is heading in the right direction (up one point since June) while 43% believed things are headed in the wrong track (down three points since June). Albertans are most likely to believe the country is headed in the right direction (65%) while Quebec respondents were least likely (32%) to think Canada is going in the right direction. Of note, 38% of British Columbia respondents believed the country was headed in the right direction while 46% believed the country was headed on the wrong track (Abacus interviewed 783 BC residents for this survey). With regards to overall government approval, Canadians were more likely to approve of the government’s job performance this month than in June. Thirty-seven percent of respondents said they approved while 47% disapproved, a three percentage point increase in overall approval. The net approval rating for the government improved by five points, from -15% in June to -10% in August. Like attitudes on the direction of the country, Albertans were most likely to approve of the federal government’s job performance (62% approve) while Quebecers were least likely to approve (20% approve). Respondents were also asked to rate their feelings towards each of the major federal party leaders. NDP leader Thomas Mulcair continues to be the only federal leader to have a net favourable impression with 31% saying they have a favourable impression and 27% having unfavourable impression. However, the latest survey finds that as Canadians become more familiar with Mulcair the number of respondents who say they have an unfavourable impression has begun to increase. Those who said they don’t know, or feel neutral towards Mulcair have declined (by four points) since June and those who said they have an unfavourable impression have increased by three points. There has been little change in Prime Minister Stephen Harper’s personal numbers from June. Thirty-six percent of respondents said they had a favourable impression, compared with 47% who said they have an unfavourable impression of the Conservative Party leader. Bob Rae’s personal numbers have not changed much since June with unfavourable numbers up slightly and favourable down slightly. 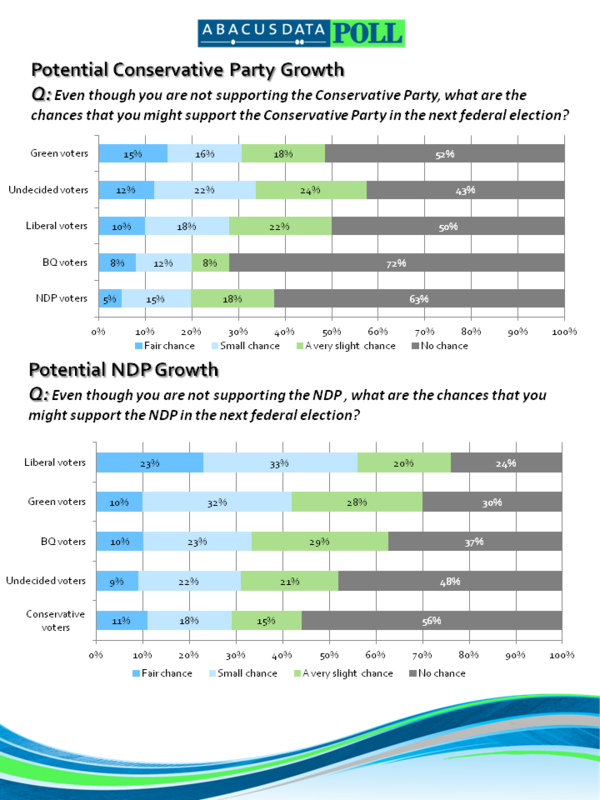 To gauge potential growth for the two most popular parties, the survey asked non-supporters of the NDP and Conservative Party what the chances are that they might support each party in the next federal election. Overall, the Conservative Party has much less room for growth with only 10% of non-supporters (including undecided voters) saying there is a fair chance they would support the party in the next election. A majority of non-supporters said there is no chance they would support the Conservative Party. The NDP on the other hand has more room to grown with 15% of all non-NDP supporters saying there is a fair chance they would support the NDP and 43% saying there is no chance they would support the Official Opposition. The Conservatives have the most potential growth among current undecided voters and among Liberal supporters while the NDP has the most growth potential among Liberal and Green Party supporters. Looking a little deeper at the numbers, the NDP has a good opportunity to grow support in BC since 21% of current Liberal supporters in the province said there is a fair chance they would support the NDP. Similarly, in Ontario, 27% of current Liberal Party supporters said there is a fair chance they would support the NDP in the next election. The percentage of Canadians who disapprove of the Harper government’s performance has dropped slightly and Canadians are a little less pessimistic about the direction of the country. 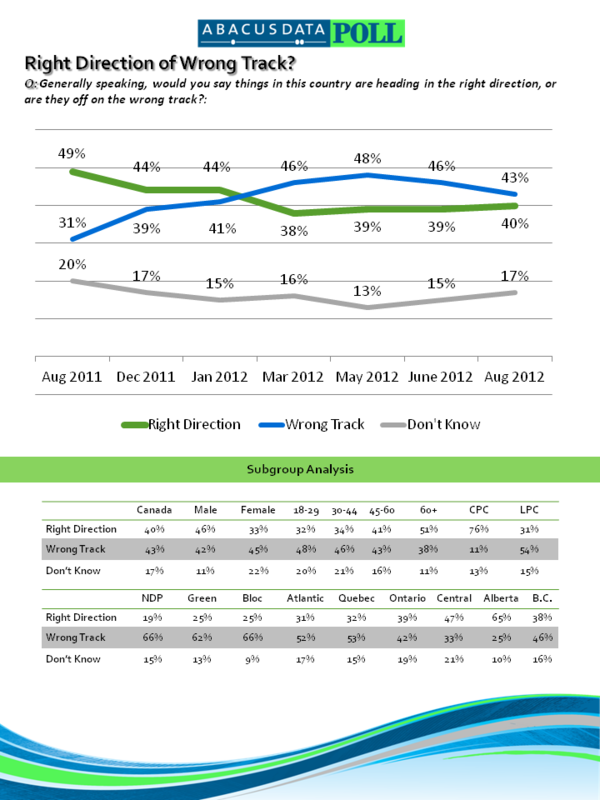 For the main party leaders, Harper remains polarizing but people’s opinion of him have changed very little since June. Tom Mulcair is slowly becoming better known to Canadians but at the same time his unfavourable numbers are rising. As both the NDP and the Conservative Party try and define the new opposition leader, we will continue to track how Canadians feel about the NDP leader. Finally, in trying to understand how vote intentions may change over time, our poll shows that there may be room for the NDP to grow support for the party particularly among Liberal and Green Party voters in the next federal election (particularly in Ontario and BC). For the Conservatives, growth seems improbable among opposition party supporters and more likely among those Canadians undecided about their current vote choice. The survey was conducted online with 2,099 respondents living outside of Quebec in English using an internet survey platform. A random sample of panelists was invited to participate in the survey from a larger internet representative panel of over 150,000 Canadians. The survey was completed from August 10-12, 2012. An over sample of was conducted in British Columbia (n=793) and Ontario (n=502). The data was statistically weighted by age, gender, region, and education level according to census data. Since the online survey was not a random, probability based sample, a margin of error could not be calculated. The margin of error for a survey of 2,099 respondents using a probability sample is +/- 2.2%, 19 times out of 20. 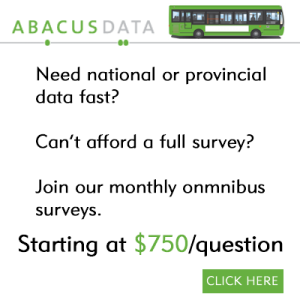 For more information about the survey, please contact David Coletto, CEO at david@abacusdata.ca or 613-232-2806.